Application error when access /_admin/createsite.aspx, Error=Object reference not set to an instance of an object. The reason for why we got this error message is due to invalid references in our Config database pointing to Content Databases that no longer exist, for whatever reason. The result of this is that the method tried to create the new Site Collection into a Content Database that doesn’t really exist, even though SharePoint thought it existed. As you can see when using the CAST(Properties as XML) bit of the query, you can get a clickable link in the results window given you an awesome overview of the XML represented. As you can see, most of the databases in our environment has a sFld and a fld xml node where the GUID of the database are stored.. That is essentially your invalid reference pointing to nothing at all. So SharePoint tries to create the Site Collection in the Content Database with the null-fld. As with previous steps, make a note of the GUID from your broken database references. The best way we found to delete these databases were by using PowerShell. At first I didn’t think it actually worked, but after re-running the SQL query after running the PowerShell command it occurred to me that the command had actually removed the invalid reference. The reason for why I didn’t think it worked is because PowerShell is throwing some errors on the screen for you, but it looks as if it’s actually working the right magic under the hood for us – thus leaving us with an intact and working farm again. So, make sure you’ve got the ID’s of your broken databases and first and foremost make sure that you haven’t copied the incorrect GUID (!) 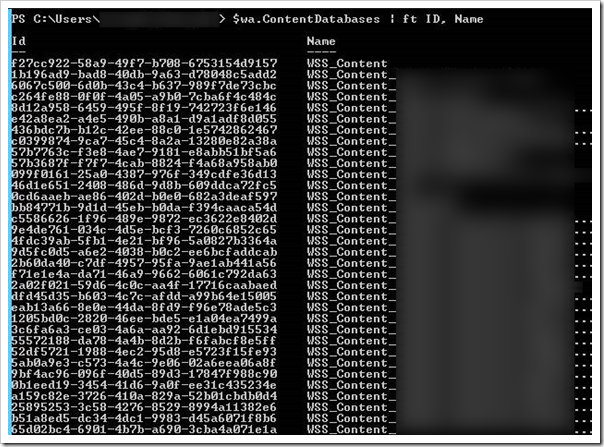 – what I did was simply query my Web Application and filtered the query to give me the ID and Names of all Content Databases so I could make sure that I didn’t delete an actual Content Database by mistake. Great, now that I’m sure the ID of the databases I copied isn’t the ID of a production DB which I know is intact, but represents my broken ones, I can execute the delete-command on those buggers! Well, I’ve learnt a lot this week about the Config database and playing around with the GUIDs within. The scary part was that these errors didn’t surface in SharePoint 2010, but they did in 2013 once we upgraded. Another good reason to get a good iterative upgrade-routine in place before an actual upgrade is attempted.